“Do you even enjoy running?” my mother inquired back in November when I told her I had signed up for my first — and likely to be my only — Ultra marathon. Why? Because after eight years of racing bikes, I had officially put an end to my bike racing last spring. Following a saddle-related surgery, a bike crash and a run-in with a car over the course of just seven months, it just wasn't worth it anymore. Still, I couldn't quite make peace with the thought of not having anything to train or work toward this winter. No race season looming. No long base-miles in the rain. No necessary gym time. What do (normal) people do on the weekends? So it wasn’t long before I stumbled upon a new challenge. 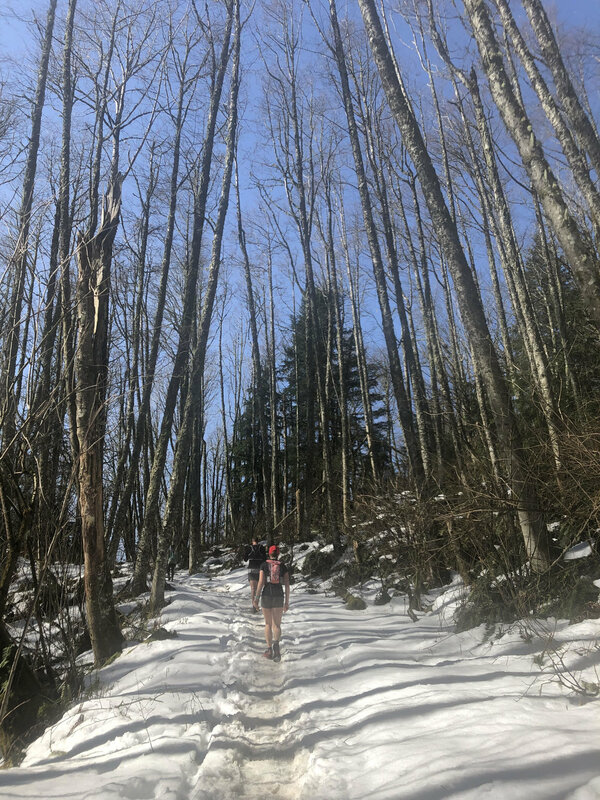 A friend's nudge was all it took, and before I knew it, I was buying some running shoes and had committed myself to run the Chuckanut 50K, Krissy Moehl’s doozy of a season opener with plenty of climbing and some stout competition. Off the couch to a 50K in four months. Seems doable, right? Minor problem: I have never been a runner and the truth is, I don't actually enjoy it all that much. It hurts, it's slow, it feels like a task and it's just hard. After 30 years of playing a tad too hard, my knees are in a sorry state and can barely keep me upright while running. They protest every step along the way and I'm so sore and stiff post-run that my gait makes an 80-year-old look spry. But I have never been one to say no to a challenge, and with the Chuckanut 50K being on March 16th — a day before my birthday — it meant I would be running 31 miles on my last day as a 31-year-old. It was too symbolic not to do it! And that is how I, an out-of-shape cyclist, found myself at the start line of the Chuckanut 50k. Completely out of my element, feeling terribly undertrained and dreading every mile ahead. I’m not going to lie, my mind was not in it. The past three months were rough. The first month of training flew by and I was crushing the half marathon distance and feeling good. But then there were some setbacks due to the holidays, unappealing wintery weather conditions, a sprained calf muscle, work travel and my training buddy dropping out with an injury. Suddenly it was March and it was go time. I had signed up for a trail marathon rather last minute to use as my last long run before the 50k. Of course, I realized that doing a marathon just two weeks out from the big day was risky, but this running business was a one-and-done endeavor so I might as well check off my first marathon along the way. But, as fate would have it, the Pacific Northwest got hammered with snow in February and so my trail run turned into a slow, snow-covered slog. With 5,500 feet of climbing and several feet of snow to contest with, I came across the line, fourth woman overall, after a grueling 6.5 hours! My only goal for the Ultra had been to finish the damn thing, but now my confidence was shot. If 26.2 miles took me that long, I was going to be at risk of not making the eight-hour time cut at the 50K, if the conditions stayed the same. Organizers, volunteers and runners alike obsessively watched the weather and trail conditions in the days leading up to the race. And when just days before the race a recommended gear list called for warm clothing, trekking polls and traction, I feared the worst. But by some miracle, Mother Nature was on our side, and when race day arrived sunny skies and mild temperatures welcomed us. Reports stated that some snow and ice remained on the trail but we’d be mostly running, not snowshoeing, this race. Now in its 27th year, Bellingham’s Chuckanut 50K has quite an avid following in the rail community and its 500 or so spots sold out in less than 7 hours. And the challenging course combined with stunning surroundings and Krissy Moehl’s notoriety attract a very stout field of competitors — not that I would have known (pro runner and race winner) Hayden Hawks from Adam. This being my third running event ever, I had no idea what to expect when I arrived at the start line in Fairhaven Park. With my running buddy out due to injury, I arrived solo yet unlike the tense atmosphere at many a bike race, I found the start line to be incredible relaxed and welcoming. No jostling for the front, no sizing one another up — just smiles and nervous excitement. The starting 6.8 miles to the first aid station were a fairly straight shot on the Interurban Trail. I clocked in around 55 minutes and felt optimistic. Most of the nearly 6000 feet of climbing takes place on the middle 18 miles, however, and almost as soon as we started climbing, my legs started talking. Oh no. People around me seemed to float uphill and I was standing still. READ THE FULL RACE REPORT IN THE APRIL EDITION OF ULTRA RUNNING MAGAZINE, OUT ON NEWSSTANDS ON APRIL 26TH. "I don't have to like it. I just have to survive it"